Yet that's exactly what's happened with the introduction of Nordic walking, a hybrid of cross-country skiing practiced by millions of people worldwide. Today, even elite athletes are likely to be found with poles in hand and no wonder. Safe and easy to perform, Nordic walking engages 90 per cent of the body's muscles. "Essentially, Nordic Walking encourages a more anatomically correct walking position, resulting in the torso and arms performing a fuller range of motion," explains June Stevenson, a Nordic walking coach based in Auckland, New Zealand. "The poles provide a postural point of reference that allows the diaphragm and chest to expand. Stride lengthens and the usually tight hip flexors and hamstrings begin to release. People participate in a low impact, total body workout that can use up to 40 percent more calories than regular walking." It's important to maintain a light grip on the pole, otherwise you risk muscle strain in the forearms. Plant poles on a downward angle rather than striking vertically. You should feel some resistance-the poles assist propulsion. "Nordic walking targets muscles in the abdominal core, shoulder girdle, chest and arm," says Stevenson. "These muscles are activated more fully as the poles provide the resistance for the muscles to act against. Increased range of motion and blood supply throughout the pectoral and thoracic spine has been shown to alleviate tension in the upper back areas. So it is quite a complete exercise. Other activities often require cross-training or gym specific exercises to balance under-utilized muscle groups, but not Nordic walking." 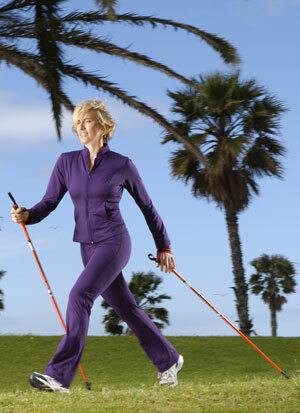 Nordic walking is an ideal exercise for the elderly, many of whom are discarding their canes in favor of poles. Lightweight and equipped with 'asphalt paws' that cover spiked tips during road treks, Nordic walking poles are considerably shorter than those used for cross-country skiing. To determine size, raise your forearm until it's positioned at a ninety-degree angle with your elbow, and then measure the distance to the ground. Reaching with the same arm and leg, instead of working them in opposition. In Nordic walking, it's left leg, right arm and so on. If you're searching for an exercise that utilizes all the muscle groups yet is easy to master, you'll love Nordic walking. "The enjoyment I experience from Nordic Walking is not limited to just the physical benefits. I also derive a feeling of psychological well being quite different from anything I've felt from other forms of physical activity. I can do Nordic walking every day, because my hip joints don't ache like they did with previous activity. No more bone-jarring jogging or one-dimensional endurance walking for me." “Each has their own reason for walking, cycling, riding a horse or a donkey. Some - unlike me - are real 'peregrinos' (pilgrims), some do it for sport, some do it to benefit a charity etc. I like walking by myself and quietly reflect on life while enjoying everything and everyone around me. That, and the camaraderie on the way and in the 'albergues' (hostels) are my reasons for walking 'The Way'. However, one needs to remain vigilant - personal safety is not guaranteed. Starting before 5 a.m. to avoid the heat, I was rewarded by some amazing sunrises which reflected on the ever changing colour palette of the undulating fields. I walked 20 to 28kms per day and took 3 rest days in total. 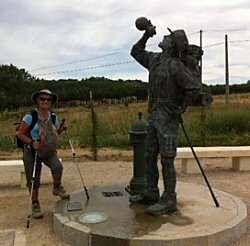 The last 4 or 5 days before Santiago, I had to reduce my walking to around 15km or less in order not to reach my destination too early. My feet had been on a roll and it wasn't easy to restrain them. I didn't feel exhausted on arrival. I credit this to the fact that I paced myself - which is easier to do when walking alone. I used my Nordic walking poles at all times - wearing out two sets of paws in the process. They gave me the support I needed for my damaged knee ligament. The scenery varies depending on the areas. Sometimes it's beautiful, at other times not so. Most villages are picturesque. However, few people are to be seen apart from those catering for peregrinos. Those coming out after siesta time - around 7pm, are mostly elderly. Children are rare and no general tourists are to be seen anywhere on The Way or in the villages as they flock to the beautiful cities. Camino walkers or riders don't see themselves as tourists. 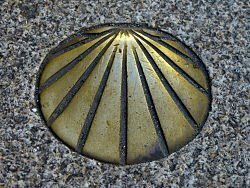 Most of the dedicated Camino albergues that I stayed at, costing between Euro 5 and 16 per night, are well appointed and clean because the competition for the 'peregrino' Euro is fierce. To overnight in them, one has to buy a 'credentiale' or 'passport' (Euro2) at one of the albergues, Tourism Bureau, Church or some other outlet. This is then stamped at each albergue. In many places there are also private hostels and hotels not requiring the credentiale. 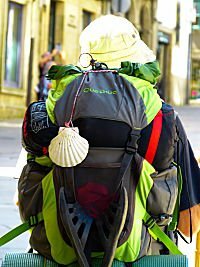 On arrival in Santiago, If one wants to receive a certificate of accomplishment, referred to as a 'Compostela', one needs a certain number of stamps and has to have walked the last 100km. Sleeping bag, sandals, 1 change of clothes, 30cm2 towel, 1p of socks, 1 small bottle of concentrated all-purpose soap, tooth paste, small tooth brush, comb, small 1st aid kit, Vaseline, foot cream, eye shades, ear plugs, sleeveless thin puffer jacket, thin wind jacket, poncho, 500ml water bottle. Small day pack, worn on on my front: guide book, camera, iPhone, sun lotion, sunhat, 500ml water bottle, reading and sun glasses, snacks. Constantly around my waist: a money belt with passport, money, bank cards and insurance details. I wore sturdy walk shoes (on sale at NZ$79) and my perfect socks (different for everyone). In the morning, I massaged my feet with foot cream until absorbed then applied lots of Vaseline before putting on my socks. After the walk, I again aplied lots of foot cream without massaging, because that would have stimulated the blood flow - my feet needed cooling off instead. I was on my feet for 9 weeks including my side trips. I suffered one painful tiny blister by walking faster than my normal pace going down a steep gravel track. I saw some people's feet so damaged that they had to give up, while others trudge on in agony - why I'll never know. In the early mornings before leaving I ate: a banana, nuts, a protein bar, lots of water. Breakfast at the next village - usually between 9 and 10am: hot chocolate, a large slice of tortilla or a cheese omelette on French bread, a pain-au-chocolat and a large croissant. I also bought extra pain-au-chocolat and croissants to keep me going until I spotted a lunch bar. Dinner: a peregrino menu at one of the restaurants in the village or town - Euro 9 to 13 for a 3 course meal. The size of the entree invariably qualified as a main! Sometimes it was tasty and sometimes it wasn't. But I didn't feel like shopping and cooking my own dinner in the albergue. Not many others did that either. Resting, showering, doing laundry, socialising, going to dinner, catching up on notes and emails, and retiring around 9pm seemed to be the general norm.